Ease your way into a state of peacefulness and bliss by adding a handful of our Soothe Bath Salts to your evening bath. The calming, fresh scent of these bath salts will fill the air while you soak, relaxing your mind as the Epsom Salts work to relieve your aching muscles. 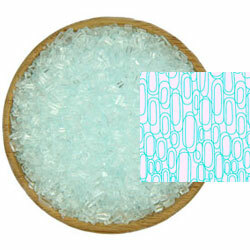 100% Pure Epsom Salt scented with a calming, fresh fragrance, with a soft blue color. Benefits: A therapeutic bath salt for general relaxation and relieving muscle aches and pains. To soothe tired, achy muscles - Pour a two large handfuls into the bath and soak for 20 minutes. Ingredients: Magnesium Sulfate (Epsom Salt), Glycerin (Vegetable Glycerin), Fragrance, Tocopherol (Vitamin E), Aloe Barbadensis (Aloe Vera) Leaf Juice, FD&C Blue 1 Lake.